TAYA GRAHAM:	She has filed roughly 350 Public Information Act requests and has been fighting a years-long court battle against the FBI, all to get at the heart of an ugly truth that receives little attention, the surveillance and subversion of dissent in this country through an FBI program called COINTELPRO. Her name is Nina Gilden Seavey, and she’s a professor of media at George Washington University, but she is also the director of a documentary called My Fugitive. It’s a film currently in production that will take an exacting look at how the FBI and other government agencies surveilled student groups at the Washington University in St. Louis in the ’60s and ’70s. It also involves a personal story for her, as it recounts the tale of leftist fugitive Howard Mechanic, who was represented by her father, a prominent St. Louis civil rights attorney, Louis Gilden. All of this takes place against the backdrop of a federal government that seems hellbent on intruding on the country’s most basic constitutional rights. Joining me by Skype is Professor Seavey. Professor Seavey, thank you for joining us. NINA SEAVEY:	Thank you so much for having me today. TAYA GRAHAM:	Before we get to your battle to obtain files on COINTELPRO, could you give us a brief explanation of what COINTELPRO is. J. Edgar Hoover and lasted for decades without actually anyone knowing about it except a very, very few people within the FBI. J. Edgar Hoover was a shadow government, if you will, unto himself. He developed a number of programs that have to do with counterintelligence in the United States against the civil rights movement, against the Ku Klux Klan, against the student movement otherwise known as the New Left. He really spearheaded an entire operation out of all of the various bureaus within the FBI on the ground using informants, using subversive techniques, black bag operations, all kinds of things that we think of today as being highly illegal, without warrants, without any restraints. You need to remember, COINTELPRO wasn’t alone. There was Operation Chaos in the CIA, which actually is forbidden to spy on American citizens and did anyway. There were many operations within the military intelligence complex, the Department of the Army. It was really a network of programs where, as we have in the film, spies were actually frequently following spies. TAYA GRAHAM:	Could you give us some background on what happened on the Washington University campus back in 1970? NINA SEAVEY:	Like on so many campuses, there were quite a few demonstrations and all kinds of civil disturbances, but on the night of May 4th, 1970, it was the night of the Kent State murders, which some of your viewers may have recalled or know about in history, which was the night that the National Guard fired on students and killed four of them on the Kent State University campus. It was that demonstration at Kent State was really in response to Nixon’s having moved into Cambodia and the bombings in Cambodia. That night on Washington University campus, and on so many campuses, there was a very large riot at which an ROTC building was burned to the ground. In the course of that riot, a number of people were identified as being the extremist terrorists, and were identified by the FBI and the Department of Justice as being people that would be brought up on federal charges. I have to remind you that on every other campus across the nation, these kinds of civil disturbances were taken care of at the local level. Indeed, all of these students were charged on municipal charges and they served time on municipal charges, but the Department of Justice decided to bring subversion charges and a variety of other treason and felony charges against these particular students on a little-known act that in the 1968 Civil Rights Act that precluded demonstrators, called the H. Rap Brown Act, from interfering with police or firefighters during the conduct of their job duties. These particular students on Washington University campus were charged on federal charges, some of which could bring 10 years and thousands of dollars in fines. For one particular individual, Howard Mechanic, he was charged and fined $10,000 and sentenced to five years in federal penitentiary. TAYA GRAHAM:	Your film focuses on Howard Mechanic. Wasn’t he arrested for throwing a cherry bomb at a police officer? NINA SEAVEY:	Allegedly. He always denied having done it, and actually, many years later it came out that he hadn’t done it. By that time, he had spent nearly 30 years living the life of a fugitive. I also have to remind you, in the context of this film, that it’s not just about what happened to Howard, but what we find out in the film is this very long ripple effect not only of what happened to Howard Mechanic but many of the other students there, other protesters, other civil rights leaders, other professors, all kinds of individuals who were blacklisted, who were shunned from society. It impeded even parts of the assassination investigation of Dr. Martin Luther King. It is a much bigger story than we can ever imagine. TAYA GRAHAM:	During that time, there were very few civil rights attorneys in the state. Your father was one of them. What role did he play in this case? NINA SEAVEY:	Howard Mechanic and a number of other students were his clients. Missouri is, as we know today, it’s just been identified by the NAACP as a state that should be avoided by many members of our society. Missouri can be quite reactionary, and it was at the time. My family and my father, and us as children, we lived under federal surveillance. We also lived under federal protection. Our lives were constantly in danger. We were constantly being threatened. We were constantly being … People would call the house and say that they were going to blow us up. They were going to abduct the children. This was Missouri in 1965 to 1975. There were, as you say, just a handful of civil rights attorneys, and my father was one of them. TAYA GRAHAM:	Against this story was the backdrop of surveillance, specifically the FBI, seeking not just to watch but to infiltrate. What do we know about what law enforcement was doing then? NINA SEAVEY:	As I said, it had to do with confidential informants, but it also had to do with these black bag operations, which are that they were interfering with people’s mail, they were setting up operations to make it look as if these demonstrators were doing things when in fact it was the confidential informants who were doing things, and then engaging so they were sting operations. There were all kinds of ways of smearing and slandering these individuals by calling them homosexuals, by castigating them. The FBI was using at that time the St. Louis Globe-Democrat, which was the conservative morning newspaper in St. Louis. It was essentially their mouthpiece. Again, these were not just black bag operations but surveillance operations. I have managed to uncover literally daily reports on these students. This wasn’t in the current era, where you can just listen in to somebody’s Skype conversation. You literally had to have boots on the ground watching these students, and that’s what they were doing. TAYA GRAHAM:	Let’s fast forward to the present. Tell us about your film, what your focus is, and how you’re going to approach this topic. NINA SEAVEY:	As you said in your opening, I just won a very large case in federal court where Judge Kessler ruled in my favor and opened up hundreds of thousands of pages of documents from the FBI and from the National Archives and the CIA, who are now giving me the documents that really outline what it was that happened and all of the information as relates to this tragedy, honestly, in American history. I’m currently in production on the film. I’m a long-time filmmaker. I’ve been a filmmaker for 30 years. As you say, I’m a professor of both history and film at George Washington University. I am interviewing people and delving into documents and have a whole team of people who are working with me on the production of this film. I think it’s going to make quite a splash when it comes out. There are some, and I’m not going to reveal them now obviously, but some amazing revelations about things that have defined America then and ever since. TAYA GRAHAM:	Part of the process for you has been this concerted campaign to get records from the FBI. What records are you now seeking to obtain and how has the FBI responded? NINA SEAVEY:	Obviously they stonewalled for quite a long time, which is as they do if they can. I made 358 separate FOIA requests, and they stonewalled, they refused to respond. This has gone on now for years, and Judge Kessler’s decision now opens up these thousands of pages to me every single month. Already, we have been finding amazing information, disturbing information, about the government’s conduct in relationship to its own citizens. It’s a process. It’s a very detailed process, but I’m a well-known, world-class filmmaker, and I have a great team behind me, and I think what we bring forward to the American public is going to be quite astounding. TAYA GRAHAM:	I think so, too. Given your research and what you’ve learned, do you think the FBI is using the same tactics with groups like Black Lives Matter and Occupy Wall Street? NINA SEAVEY:	Interestingly enough, my attorney is the same attorney for Occupy Wall Street and the new inauguration protesters. If you notice, these inauguration protesters are also being brought up on federal charges. The government, the FBI, the Department of Justice, and we actually don’t know who else, Homeland Security, we have no idea, have infiltrated these organizations. They are doing surveillance on these organizations. This is in some ways this deja vu moment of what was happening in the 1960s and ’70s with the civil rights movement, with the student left movement, with the dissent movement. We have Attorney General Sessions and Donald Trump, who are more than eager to engage in these same warrantless acts. TAYA GRAHAM:	For example in Baltimore, we found out that there was an undisclosed aerial surveillance program paid for by a private donor, and was being used by Baltimore City Police that could track a person from the sky 24 hours a day. What do you envision our government or law enforcement doing with technology in the future? Do you think we can actually save privacy and civil liberties? NINA SEAVEY:	As I always say in the making of this film, it’s not just what you know but it’s how you use it. 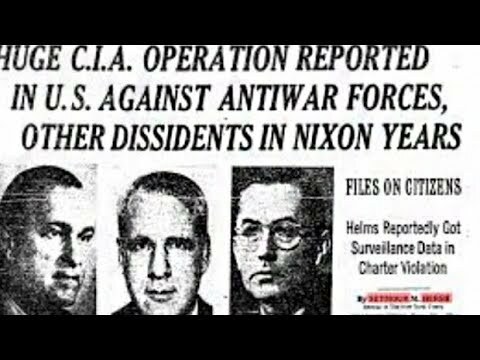 We have had surveillance programs obviously since before COINTELPRO, since during COINTELPRO, and Operation Chaos, and Operation Garden Plot, and all of these other, Operation Merrimack. All of these programs were the harbingers of what it is that we’re seeing today in a much more sophisticated and technological way. You can garner all of this information, but the question is, what do you do with it? How do you use it against your own citizens? You can bring these people up on federal charges. You can make inferences. You can start to connect dots that don’t exist. If you start to interpret all of this information through a political lens, which I think certainly now exists in this country, then it becomes literally a tool of repression. We need to be on alert. It’s not just the collection of information. It is the way in which that information is interpreted and then used against its own citizenry. TAYA GRAHAM:	When will we be able to see this film? What’s your expected completion date? NINA SEAVEY:	Unlike the news business, I always hate to say it to a journalist, but filmmakers take their time. We are very thorough in distributing a film. We will be in production on this film through 2017, the rest of this year, and then 2018, hoping to get it out in 2019. The creation of a film is really quite an elaborate both research and production effort as well as an artistic effort. For those people who have seen my previous work, it is known for its intense artistry, and this film will be no different. TAYA GRAHAM:	I think your project is going to be absolutely incredible, and it’s going to raise the awareness of people of how our government has misused our surveillance capabilities in the past and what they actually might be doing now. I think it will provide some great insight. I want to say thank you to my guest, Professor Seavey, for joining us. I’m your host, Taya Graham, and I want to thank you for joining the Real News.